Accurate and up-to-date performance data fuels the success of your business. But with data stored in several depositories, getting a clear, one-off view of your current business status is difficult, right? Wrong. Thousands of businesses just like yours are discovering how easy it can be with Microsoft Power BI. 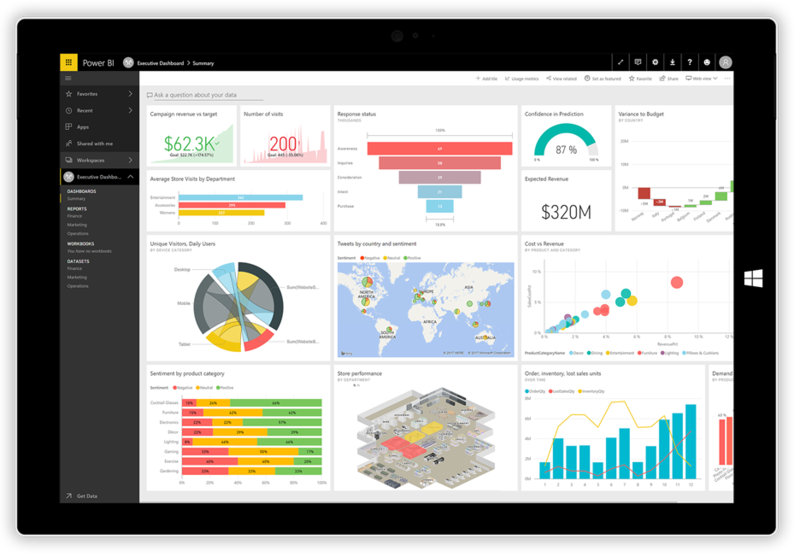 Power BI is an online service where you can easily create dashboards, capture important data and share reports that are important to you. Power BI gathers all your data, whether it is on-premises or stored in the cloud, into one central location that you can access whenever and wherever you want. You can also use pre-packaged content packs and built-in connectors to quickly import your data from solutions such as Marketo, Salesforce, Google Analytics, and many more. Power BI includes native mobile apps that support your mobile Android™, iOS® and Windows® devices letting you share dashboards and reports with whoever you want, wherever you go, and whatever device you are using. Whether you’re evaluating your business needs, looking for packaged industry solutions – or just need help getting started with Power BI, our experienced team can guide you every step of the way and ensure you get the right solution for your business.